Jean-Louis André Théodore Géricault, a French lithographer and painter was born on September 26, 1791 in Rouen, France. He was a pioneer in the French Romantic movement and was known widely for his oeuvre, “The Raft of the Medusa.” He was born into a wealthy family that belonged to the bourgeois class. From Rouen, they moved to Paris when Gericault was still a young boy. He was someone who was very interested in equestrianism. In 1808, at the age of 17, he received his art training from Carle Vernet, a horse painter who taught him the tradition of English sporting art. After three years, he joined Pierre-Narcisse Guérin, who taught him classical figure composition. Géricault did not stay in school for long but instead opted to visit the Louvre, which became his classroom. There he spent his time copying the paintings of Rembrandt, Velázquez, Titian and Rubens from 1810 to 1815. Géricault also spent considerable time in Versailles where he devoted much of his time in the stables of the palace. It was from there that he got his knowledge of the action and anatomy of horses. “The Charging Chasseur” that was exhibited in 1812 at the Paris Salon, was the first major work of Géricault. It showed the influence of Rubens and his interest in creating contemporary subjects. For the succeeding years, the artist created several studies of cavalrymen and horses. In 1814 he again participated in the Salon and exhibited his “Wounded Cuirassier.” It was not as well-received as the painting he entered in 1812. Due to his disappointment, he joined the army and worked in the garrison of Versailles for a while. He continued to paint and studied composition and figure construction, at the same time showed his preference for expressive force and drama in his work. From 1816 to 1817 he traveled to Naples, Rome and Florence and studied the works of Michelangelo. The city of Rome inspired him to begin a huge canvas called the “Race of the Barberi Horses” although it was never completed and he returned to France, painting “The Derby of Epsom” in 1821. Géricault was one of the first proponents of French Romanticism in the 19th century and lived it as well. Because he was independently wealthy, he was able to engage in his passions – horses and paintings. He painted when the mood suited him. He lacked the length of formal art training like other artists and was only serious with his work when he was inspired. Nevertheless, his style was influenced by such artists as Antoine-Jean Gros. On the other hand, he was influential to younger artists such as Eugene Delacroix, one of the greatest exponents of Romanticism. Géricault also influenced engraver and history painter Paul Delaroche. Although interested in painting horses, Géricault was also an outstanding portrait artist. His portraits of asylum inmates depicted haunting realism. In 1817, after his travels to other parts of Europe, Géricault wanted to create art that depicted current events. He wanted to show the contemporary reality that was being depicted in the works of Gros and popular British writers during the Romantic period, such as Walter Scott and Lord Byron (George Gordon Byron). Géricault was dreaming of creating monumental works about modern life. Dissatisfied with the outcomes of his experimentations of several themes, he learned of the poverty and needs of the people who survived the wreck of a French frigate called “Medusa.” It left 150 soldiers to fend for themselves on a raft, where only 10 survived during their 13-day odyssey. Géricault was inspired by the story and thoroughly researched the subject and interviewed the author of the pamphlet he read. He was determined to paint a huge canvas and created several sketches until he was satisfied with his composition. He was dedicated to the task, even shaving his head so he will be forced to stay in his studio. He surrounded himself with corpses so that he could make the correct representation of the lifeless bodies. However, the monumental painting, which symbolized hope, was not well-received. The French government did not want to encourage any form of sensationalism and because the theme was not a huge one, it was not that popular. Disillusioned by these facts, he took the painting on a traveling exhibition to England around the 1820s, where he gained more success and a fair bit of income. 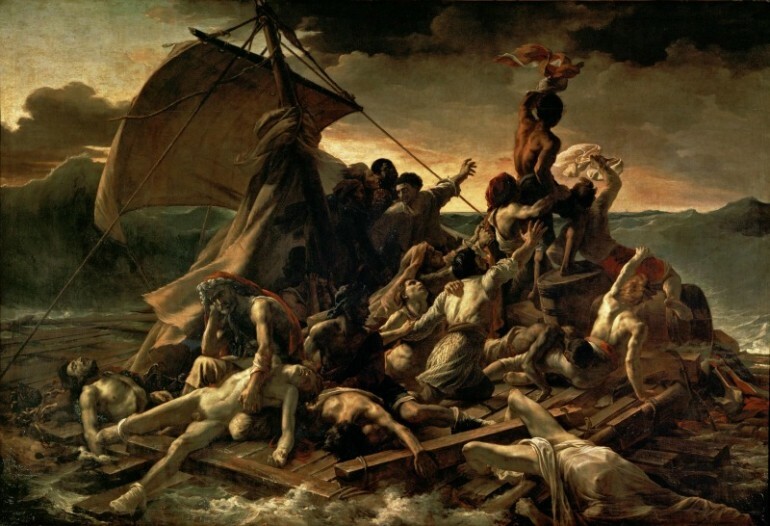 “The Raft of the Medusa,” which measures about 16 feet by 23 feet now hangs at the Louvre. 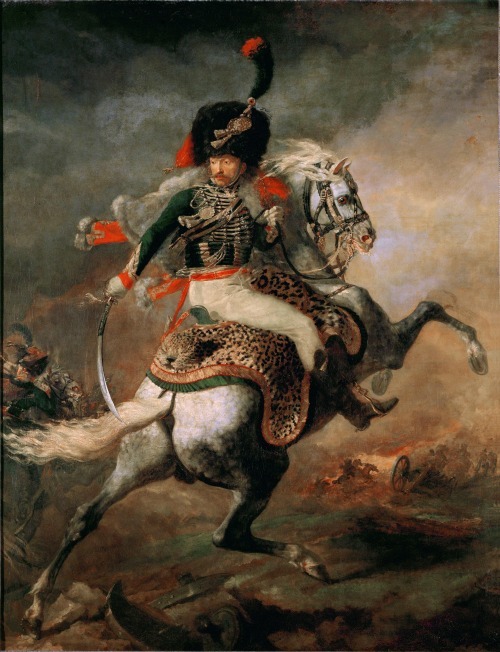 Surprisingly, Géricault, who was fond of horses since he was little, suffered from several equestrian accidents, which eventually took his life at the age of 33.